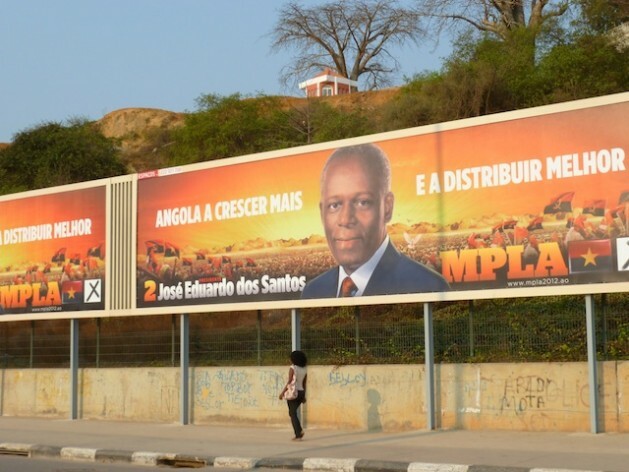 LUANDA, Sep 4 2012 (IPS) - Question marks hang over the legitimacy of Angola’s general election as Africa’s second-longest serving leader Jose Eduardo dos Santos has won a five-year term in office following his party’s landslide victory. The Popular Movement for the Liberation of Angola (MPLA) – which has ruled Angola since independence from Portugal in 1975 – secured a parliamentary majority of just under 72 percent. Its former civil war enemy, the Union for the Total Independence of Angola (UNITA), is second with nearly 19 percent, almost doubling its 2008 tally. Third is the newly-formed Salvation–Electoral Coalition (CASA-CE) which won six percent of the vote, according to provisional results released by the National Electoral Commission (CNE) on Monday, Sep. 4. But while the MPLA – whose lavish campaign is reported to have cost over 70 million dollars – is celebrating its win, UNITA, CASA-CE and civil society groups are understood to be working on legal challenges to contest the results. Once the final results are in, there is a 48-hour window available for a party to lodge a legal challenge with the southern African nation’s constitutional court. In a statement issued on Sep. 3, UNITA said it was running its own parallel counting and was following the provisional results being presented by the CNE. UNITA accused the CNE of using government security staff to run polling stations, questioned its processes for transmission of data, and complained about how many party delegates and observers had not been able to get accreditation to monitor proceedings. The party has been critical of the CNE and its preparation for the election for some months, alleging fraudulent manipulation on the part of the MPLA. Complaints have centred around voter lists, the way they were compiled, audited and shared. UNITA claims thousands of “ghost voters” have been added to the rolls and that the delay in publishing the final list would prevent many people from voting. “We will not allow a brand of fraud to take place and we will not recognise the legitimacy of any government resulting from elections held outside of the law,” UNITA leader Isaías Samakuva said a week before the vote was due to take place. On Aug. 31, the day of the elections, many people – exact numbers are unknown – were unable to vote due because they were unable to find their names on the voters’ list. Some were told that they were actually registered to vote several hundred kilometres away in another province. The provisional results from the CNE indicate turnout was down significantly from 80 percent in 2008 to 60 percent this year. Turnout was significantly lower in the capital Luanda at around 50 percent. However, teams from the Southern African Development Community (SADC), the African Union (AU) and the Community of Portuguese Language Speaking Countries praised Angola’s CNE for the way it organised the election. The AU mission chief, Cape Verde’s former President Pedro Pires, noted some issues with delayed accreditation of party delegations and observers, unfair access to public media space and a failure to allow diaspora voting. However, Pires said overall the election was “free, fair, transparent and credible”. Angolan musician and activist Luaty Beirao, who has been involved in various anti-government street protests and has helped set up a website that has been publishing complaints from the public about the election, told IPS that he was very disappointed in the observation missions’ standpoint. “How can these elections be considered fair?” he asked. “How can you say that thing went well just because there were no fights and people were not throwing stuff at cars or burning tyres in the street? The CNE has denied any wrongdoing and the MPLA has accused the opposition of making up allegations of fraud to distract from their poor results. The MPLA, however, has already claimed victory and many ordinary Angolans seemed oblivious of UNITA’s claims. Avelino Pacheco, 22, from Luanda, told IPS: “In my opinion these elections went very well and we were free to chose who we wanted. The people have chosen the MPLA and President dos Santos. “There was no fraud, we must respect the choice of the people,” the statistics student said. Six other parties and coalitions, including the historic National Front for the Liberation of Angola and the Party of Social Renovation, shared the remaining three percent. The country’s 27-year civil war only ended in 2002 and since independence in 1975 Angola has only had two previous elections. The 2008 poll passed peacefully despite widespread allegations of vote-rigging, but the election in 1992 was abandoned midway and triggered a second phase of the civil war that lasted until 2002. The first civil war began after independence in 1975 until 1991. Under the terms of the country’s 2010 constitution, the head of the party that wins the most parliamentary votes becomes president – thus Dos Santos is returned automatically to power. This will be the 70-year’s first official mandate, Russian-trained engineer never having previously been formally elected, despite having ruling Angola since 1979. While the oil-rich country has enjoyed stellar growth since the end of its three-decade civil war in 2002, and is forecast to see a GDP hike of 12 percent in 2012, only a few of its people have shared in the peace dividend. According to the United Nation’s 2011 Human Development Index, Angola ranks 148 out of 187 countries and more than half of the population lives below the poverty line without access to basic services.